Dr Gavin Reid is a consultant on learning disabilities at the Centre for Child Evaluation and Teaching (CCET) in Kuwait, and an independent educational psychologist in Vancouver, Canada. He is also co-founder and director of the Red Rose School for children with specific learning difficulties, St Annes-on-Sea, Lancashire, UK. He was formally senior lecturer at Moray House School of Education, University of Edinburgh, UK. Other Books by Gavin Reid. How Should We Define Dyslexia? 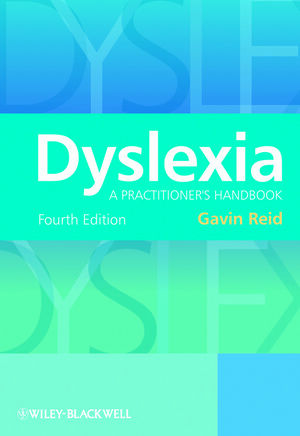 Chapter 2 Explaining Dyslexia: The Range of Research. Phonological Awareness and Multisensory Programmes. Chapter 3 Assessment: Issues and Considerations. Factors that can Prompt Concern. Linking Assessment with the Planning of Intervention. Chapter 5 Assessment: Approaches and Resources. The Use of Tests—Points to Ponder. Comprehensive Test of Phonological Processing (CTOPP). Gray Oral Reading Tests (Gort-4). Wechsler Individual Achievement Test (WIAT). Chapter 6 Reading—Social, Cultural and Government Perspectives. The Social Context for Literacy. Literacy Standards and International Comparisons. Chapter 7 The Acquisition of Literacy. Limitations of the Stage Model of Reading. Relationship between Phonology and Orthography. Chapter 8 Reading Models and Methods. Bottom-Up and Top Down Models. Methodological Issues in Reading Intervention Research. Factors to Consider in Developing and Using Reading Approaches. Chapter 9 The Acquisition of Literacy: Spelling. Relationship between Writing and Spelling. Cognitive Skills Associated with Writing. Developing Metacognitive Skills through Writing. Chapter 11 Teaching Approaches: Points to Consider. Chapter 12 Supporting Literacy: Individualised Programmes. The Hickey Multisensory Language Course. Toe By Toe: Multisensory Manual for Teachers and Parents. Chapter 13 Supporting Literacy: Approaches and Strategies. Creativity and the ‘Gifted’ Dyslexic Student. Chapter 15 Inclusion: Curriculum Access. Responding to the Diverse Needs of Students. Chapter 16 Inclusion in Secondary Education: Accessing the Curriculum. Multiple Intelligences in Secondary Schools. Chapter 17 Inclusion: Further and Higher Education and the Workplace. Chapter 18 Issues and Concerns. Issue 2. The Use of Computers and Technology. Issue 3. Overlap, Continuum and Intervention. Issue 5. Training and Professional Development. Chapter 19 The Role of Parents. Appendix 1 Some Tests for Dyslexia that Can Be Used by Teachers.